A KitchenAid meat grinder attachment does many tasks of kitchen in one handy, single unit. If you have a meat grinder attachment in your kitchen, you are free from the hassle of getting separate kitchen appliances like a pasta maker, food mincer or sausage stuffe. With the help of this multitasking gadget, you will save money while multitasking. From grinding meat to making baby food, preparing pasta, bread crumbs, salsa and spreads, a meat grinder is a flexible, versatile addition to your kitchen. 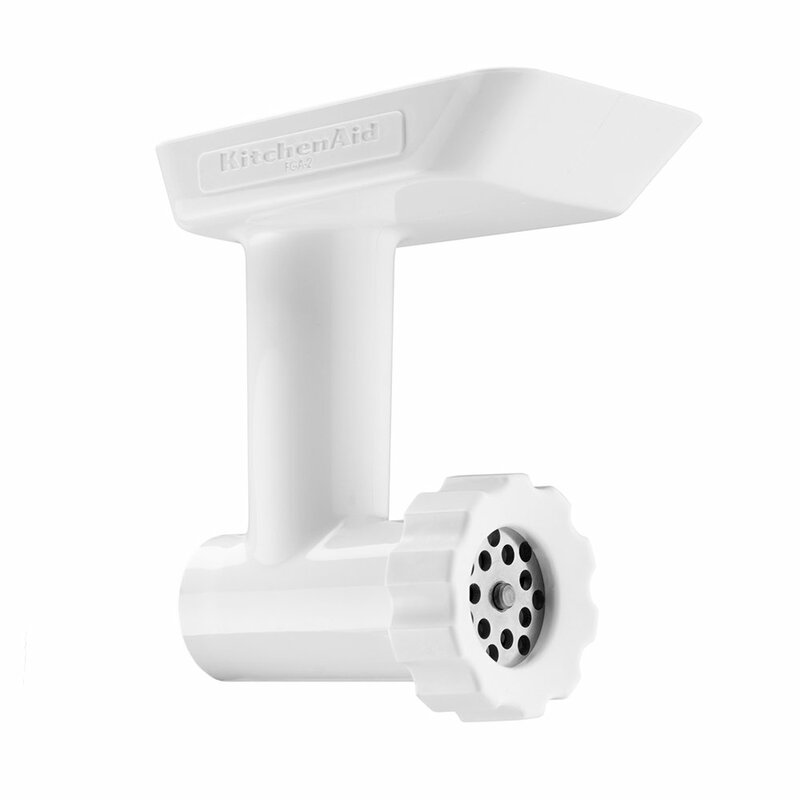 The KitchenAid Meat Grinder Attachment is a fantastic tool to add flavor to your daily meals. Cut the meat into small cubes and throw them into the meat tray but keep in mind to put the meat in freezer for a while before grinding to avoid smearing of the meat. Process sausage mixtures with your sausage stuffer, prepare spaghetti, macaronis and baby food with the Pasta Maker and enjoy new flavors and old favorites. Cleaning is a breeze as most parts are dishwasher safe. Just hand wash the blade and cutting knife to avoid any injury and keep them razor sharp. Before attaching the Stand Mixer Attachment, make sure it is unplugged and switched off. Unfasten the knob by turning it anticlockwise and take out the hub cover. Fix the shaft housing into the hub with care. Now tighten the attachment knob by turning clockwise. To assemble a meat grinder attachment, you need to slot the grinding worm into the body of grinder and place the cutting knife at the extended end of the worm over the square shank. Afterward, place the coarse or fine grinding plate over the cutting knife and then place the ring on the grinder body. Turn the ring to secure it but don’t overtighten it. When the unit is ready for operation, run the grinder at speed 4 and start grinding away. If you are grinding beef, it is better to run the meat through the grinder twice to get a better texture. However, if the meat is full of fat do it once otherwise you’ll lose these valuable fats. Use the coarse grinding plate first if you are dealing with beef, dense veggies, dry fruit, bread and cheese. After the first grind, you can change the grinding plate from coarse to fine for optimum texture. When you have done all this, it’s time to dismantle the unit and put it in the dishwasher 9except the blade and knife). Use warm soapy water to remove all remnants and avoid bacteria building. Dry all parts immediately after washing to prevent discoloring and rust. The KitchenAid meat grinder attachment is a great best solution for many kitchen jobs. 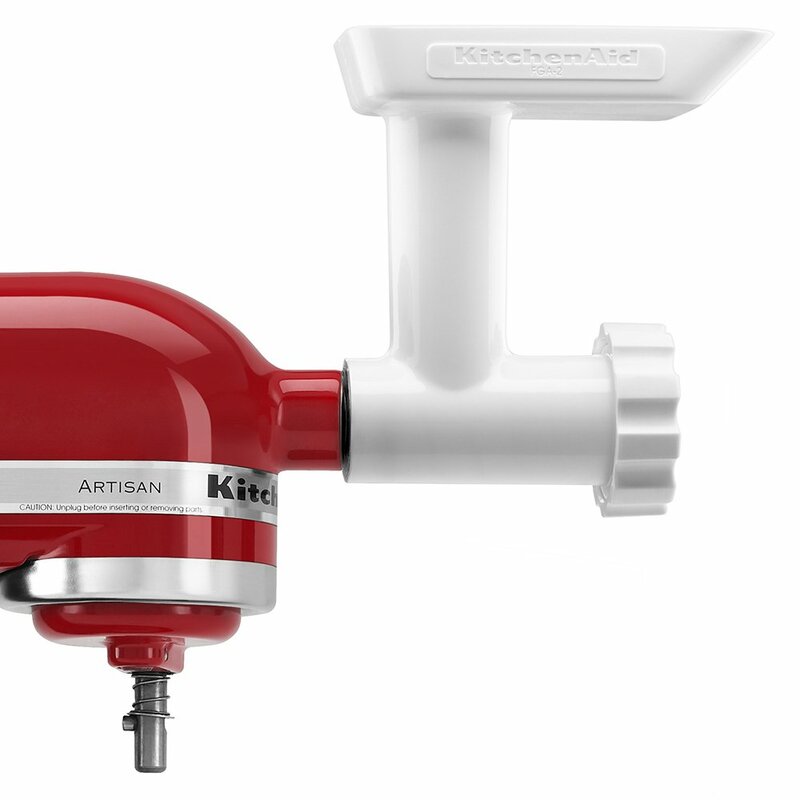 The Kitchenaid Meat Grinder Attachment is highly efficient, durable and multitasking. It’s capable of mincing meat, making salsa and making bread crumbs. By getting this fabulous product, you will make great savings as you will not need to buy a separate meat grinder. There are few products in the meat grinder family which are dishwasher safe but the KitchenAid Meat Grinder Attachment is an exception. The whole unit is dishwasher safe. It’s just the cutting blade that needs to be washed by hand to maintain the sharpness of the edges. The KitchenAid meat grinder attachment is best for small families or couples and individuals to add flavor to their daily meals. If you are a food lover and looking for a multitasking meat grinder attachment to prepare a wide variety of gourmet meals, sausages, pasta and chutneys then this product is ideal for the purpose. However, it is not as efficient a meat grinder as more commercial units. By far the bulk of readers are extremely happy with this product and there is not much which people report back negatively. The KitchenAid Stand Mixer Meat Grinder Attachment is the perfect kitchen gadget to add texture to your daily meals. It is affordable in every way, whether you think about its price tag or its multitasking functionality. Just buy one and get lots of food appliances in one bundle. Take care of your meat grinder attachment and it should serve you well for years to come. http://meatgrinderexperts.com is a participant in the Amazon Services LLC Associates Program, an affiliate advertising program designed to provide a means for sites to earn advertising fees by advertising and linking to Amazon.com. Certain content that appears on this website comes from Amazon.com. This content is provided ‘as is’ and is subject to change or removal at any time without prior notice.